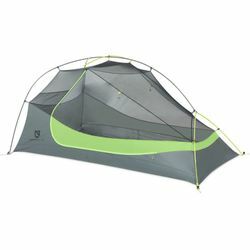 NEMO Dragonfly 1P Ultralight Backpacking Tent. Dragonfly™ fills the void for most backpackers with an ideal balance of weight and livability in a freestanding tent. The large trapezoidal vestibules are designed to fit gear without obstructing entry and have multiple roll-back points to customize visibility and coverage.